Last week was a super fun week here in Boulder. Todd's family came out for a visit and got to meet my parents and sister. We went hiking, went to a Rockies game, ate good food and got spend some quality family time. It was great! I can't believe we are already to block 9! We are already starting to work on our next BOM (coming this October =] ) so it makes sense that this QAL is winding down. But at the same time, it has been so much fun to see everyone's blocks! We named block 9 Film Strips. We went back and forth between Film Strips and Paint Chips. We ultimately chose Film Strips because we loved the idea of featuring fabrics in the squares that looked like images. Now, let's take a look at our blocks! This has turned out to be one of my favorite blocks! I used 12 different low volumes for the colors. 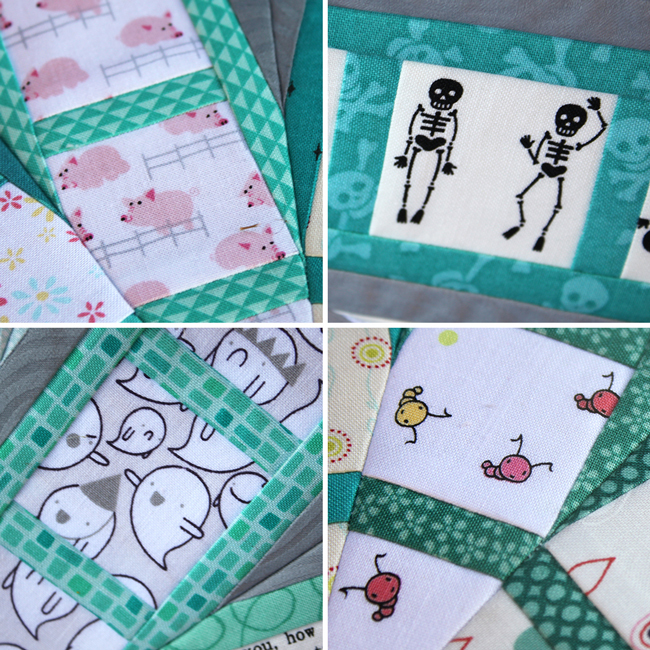 There are some very cute pigs, bugs, ghosts, skeletons and raindrops hanging out in those squares. Teal is the next accent color, so I placed 12 different teals as where the light is. They surround the low volume fabrics and make your eye settle on the cute fabrics! Next to the teal, I placed my grey tone-on-tone. The last two patches were filled with one of the featured low volume fabrics and then another light teal low volume. How I placed the light teal, they form little triangles when the wedges get sewn together. 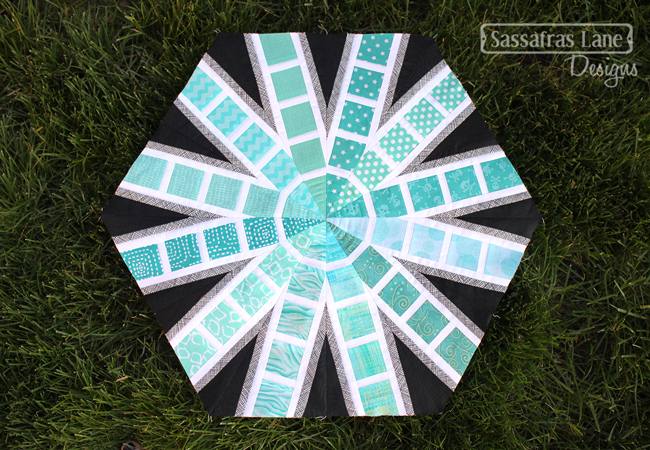 Kristy followed the original pattern for this block with one small twist. 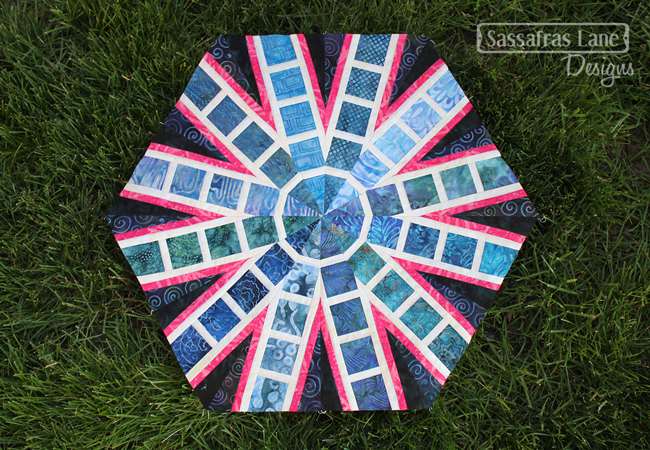 She chose 12 different teal, blue and purple batiks for the colors, placed her cream batik in the light places and her pink in the medium. Her twist on this block is the two different darks. She used her typical dark for the A wedges and the dark purple swirling batik for the B wedges. It adds a little fun interest to the edges of the hexagon. I love, love, love this block! Teal was the next color up in color order. Kristy followed the pattern for this block once again. The teals radiate from the center. It looks like a beautiful teal flower! Instead of color options, I thought it might be fun to brainstorm some fussy-cutting ideas! Stripes - Bright and fun stripes radiating from the center would be a neat twist. Large Florals - I would love to get a rainbow of Kaffe Fassett fabrics to feature in the colors going around the hexagon. Photos - Print your favorite photos onto fabric and make a beautiful memory block. And this week's winner is.... Cathy Luff! 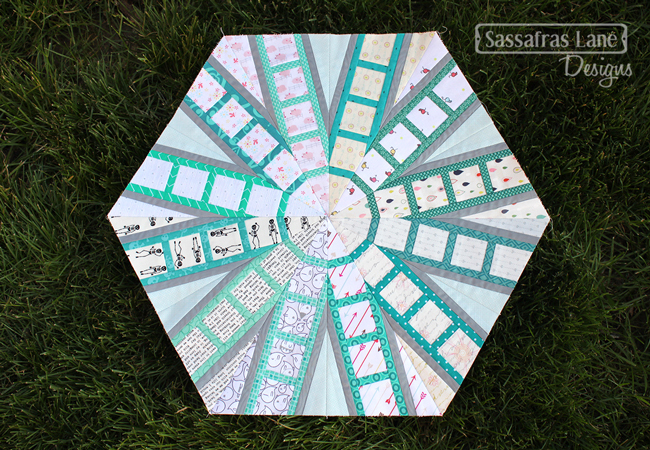 She shared this beautiful version of our Circling Geese Block. Believe it or not, this is her first paper piecing project! Isn't that amazing? 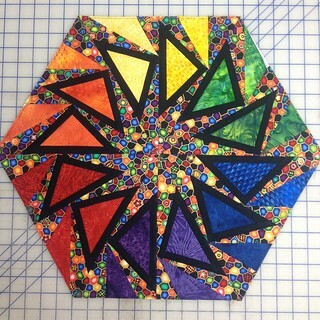 Her rainbow batiks mixed with the multi-print and solid black makes an absolutely stunning block! Now your turn! We want to see how your blocks turn out! We have a Flickr group so you can add your photos there! We will pick one winner with each post for a small giveaway from everyone who participates. First time here? No problem! Join in the fun. Grab a book here, read up on the previous posts here and begin when it works for you! Be sure to use the #ArcadiaAvenueQAL hashtag on Instagram and Twitter too! Thanks for stopping by! Oh dear! Number 9 already???? Wow, am I ever behind!!! But my teaching commitments are now behind me for a little while and I’m determined to catch up on these gorgeous blocks. After all, I have to be ready for the next BOM, right? Seeing all of your versions (and Cathy’s burst of colors) makes my fingers itch to get started right now!